Synopsis: The Steinsaltz Talmud is the most accessible edition available of the Talmud, the nearly 2,000yearold, central text of the Jewish people. 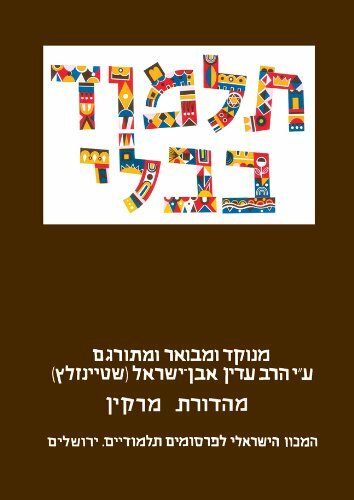 Translated from the Aramaic to modern Hebrew, with explanations and commentary by one of the great Talmud scholars of all time, Rabbi Adin Steinsaltz, The Steinsaltz Talmud fosters deep and creative engagement with the text. The Steinsaltz Talmud offers solutions to linguistic and contextual issues in the text, removes obstacles stemming from the its nonlinear construction, and provides succinct commentaries, pertinent Halachic rulings, explanatory notes to Rashi and other commentators, detailed indexes, and background from the sciences, history and the humanities. The Steinsaltz Talmud enables both beginning and seasoned students to participate in the living Talmudic conversation.